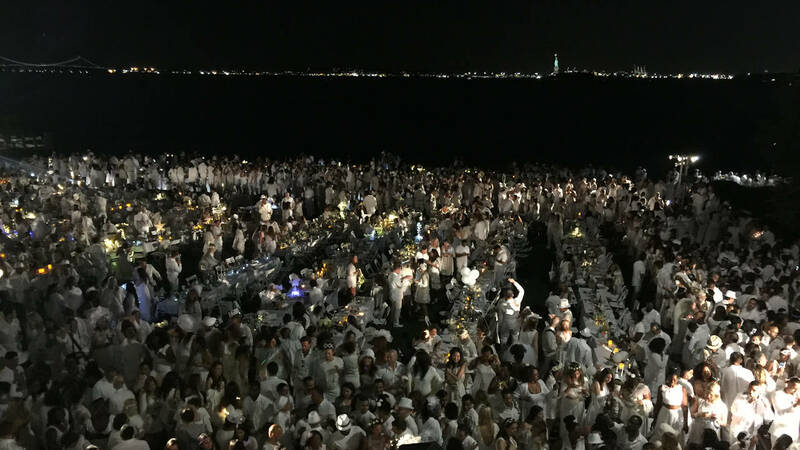 BATTERY PARK, Manhattan (WABC) -- Thousands of people dressed elegantly in white flocked to Battery Park on Thursday night for a secret outdoor pop-up dinner party. 5,000 people were given invites to this year's "Diner en Blanc", an event that began in France nearly 30 years ago, and has since been held in 70 cities worldwide. The highly sought after event requires participants to bring their own white tables and chairs, along with dinnerware and food to a top secret location that's only revealed at the last minute. The tradition requires guests to wear all-white fashion, with some also wearing masks, Marie Antoinette wigs, angel wings, and white headpieces. Prior to the start of the event, all guests were split up amongst 23 different meeting points across Manhattan, and then led to Battery Park once it was revealed as the secret location. This year's event in New York City had a waiting list of 45,000 people.